Are You Ready for a Pool Remodel? Maybe your current pool is outdated, in disrepair, or, even worse, starting to pale in comparison to your neighbor’s! 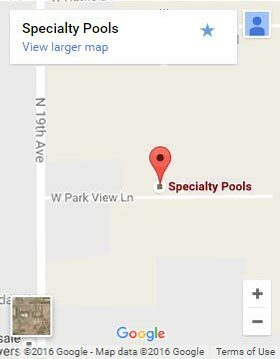 If so, then you’ll be glad to know that Specialty Pools can help you with a head-turning pool remodel in Peoria. No need to ditch the old one for a whole new system, our restoration services can work with your existing design. We can even go over additional features and add whichever ones you like into the mix. We work with you through every step to plan the best pool makeover possible. Choose award winning pool remodeling in Peoria! We work with you to create the paradise you’ve always wanted. Call us today! We offer financing, so up-front costs don’t cause a roadblock. We let you do the adjusting, customizing, and personalizing so you don’t feel limited by showroom pool designs. You won’t be left in the dark! Our personalized service means you will have a go-to superintendent throughout the entire process. Our prices are always competitive due to our longstanding relationships and professional reputation with sub-contractors and suppliers in the area. We offer the best options! The backyard swimming area is often a key feature of Arizona homes. It offers respite from soaring temperatures, keeps the kids busy for hours, and offers are relaxing lounge area for any time of day. So, if you are happy with the general structure of your existing pool, we can work with it and come up with a solution that retains its original features. On the other hand, if you’re looking for a dramatic upgrade, we have several options that will cost far less than installing an entirely new framework. Remodeled swimming pools are equally durable and last as long as a new pool. Additionally, we can help with adding fun new features such as tubs, waterfalls, and rockeries. Don’t hesitate to call. We gladly serve the Peoria area!